Crispy Corned Beef Hash is the way to go with St Patrick’s day leftovers! Don’t forget to add that runny egg on top! Corned beef is a little bit like pumpkin, what the what I hear you say? Obviously not in the taste sense, but because it only seems to fill the stores for a few months of the year. Plates upon plates of corned beef and cabbage on St Patrick’s Day usually means one thing…Corned Beef Hash for breakfast the next day. There can’t be many easier recipes to make than corned beef hash. The longest and most boring part is cooking the corned beef and you’ve already done that the day before. All you have to do is boil some potatoes, chop up the corned beef and let it get all crispy and tasty in a skillet. Lastly, and probably the most important stage is adding an egg (or 2) at the last minute. 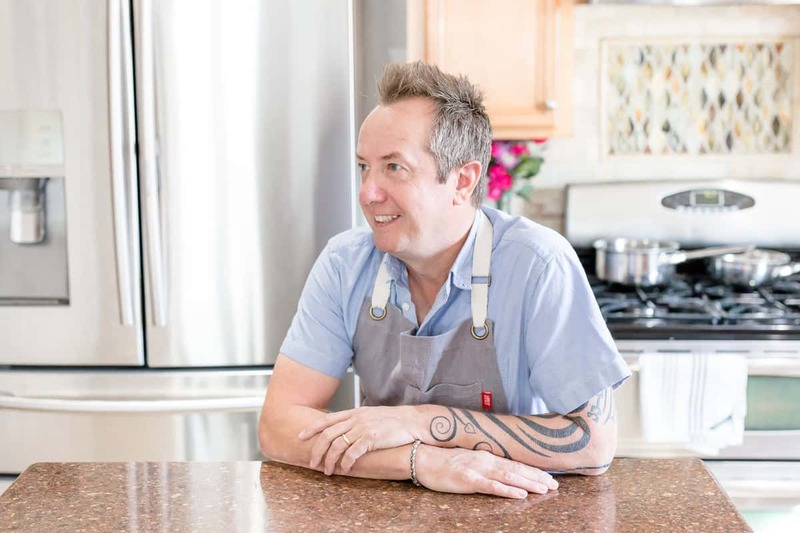 I love my eggs yolks on the runny side and by using Safest Choice Eggs, I know I can eat that egg safely because it’s been pasteurized using an all natural method. Once the corned beef hash is ready, carefully lay that soft egg on top and dig in. I love to splash it with some hot sauce and watch that yolk pour out all over the crispy corned beef. Some people say that this may be a perfect hangover cure if you drank too much Guinness the night before. Either way you’ll start the day feeling awesome after chowing down on this! You can win $1000 by entering the Safest Choice Eggs for Everyone recipe contest! Just follow this link and add you’re awesome recipe for a chance to win some major cash. 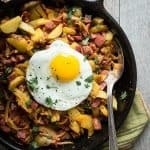 More fantastic corned beef hash ideas from other bloggers! As an ambassador for Safest Choice Eggs, I’m able to bring you easy recipes like this one. All thoughts and opinions are my own. An easy way to turn those corned beef leftovers into something amazing! Boil the potatoes in a pot of boiling hot water for 15 minutes. Drain and set aside. Heat the olive oil in a large skillet or pan. Add the sliced onion and cook over a medium heat until they start to turn soft, about 5 minutes. Sprinkle the chipotle powder over the mixture, stirring well. Add the chopped corned beef and season with salt and cracked black pepper. Cook for about 10 minutes over a medium-high heat and the hash starts to become crispy and brown. Add the cilantro and gently mix through. Turn the heat down to low. In another smaller pan, heat the remaining 1/2 tablespoon olive oil. Cook the egg or eggs until the whites are just cooked. Carefully transfer the egg to the hash and garnish with some more cilantro. Serve at once, bursting the egg yolk and letting it mix with the hash. Mmm… I love corned beef hash and I love this with the egg on top! This is my kind of comfort food and with the egg on top it is incredible! Nothing better than cracking an egg on this for breakfast, especially this time of year! You can’t beat a good hash! This looks wonderful! oh yes please, I’d like to be enjoying a whole skillet full right now! Gorgeous photo, I’m now starving….thank you! 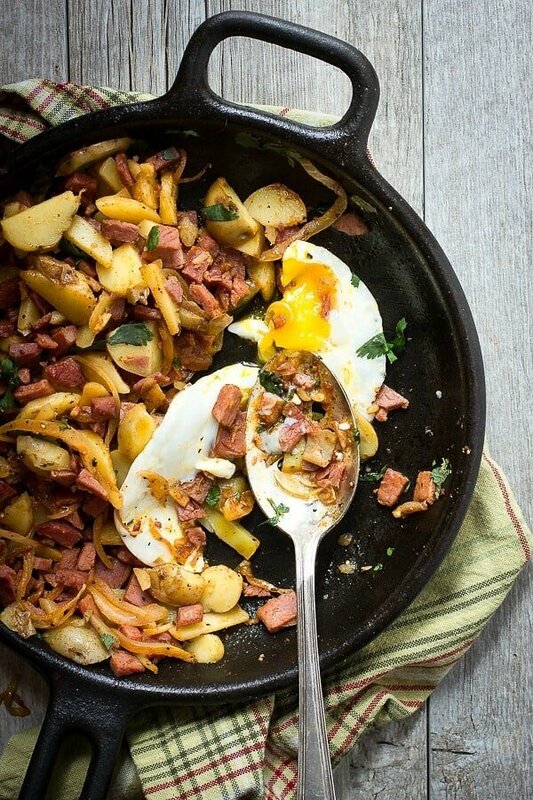 I love hearty skillet dishes like this hash. It looks super delicious & easy to make too! 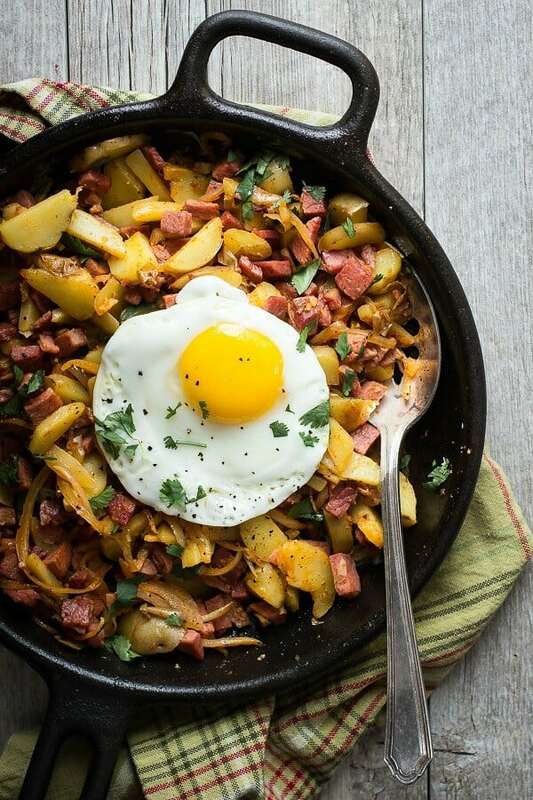 I could eat this skillet of corned beef hash every meal of the day! What a delicious dish! What a delicious recipe, perfect for leftover Corned Beef! My husband will be so excited to see this recipe! That EGG!!! This is so dreamy! I’m relatively new to corned beef, this looks fantastic and your photos are gorgeous! Safest Choice Eggs are my FAVORITE! And I am ALWAYS looking for new breakfast ideas. Oatmeal just gets old sometimes. Can’t wait to try this! Pinned! I’m pretty sure corned beef hash is right up there on the list of hardest foods to photograph, but these photos are truly beautiful! Stunning! One of my favorite breakfast dishes of all time!!! One of my favorite breakfasts! Also a great way to use leftover ham.